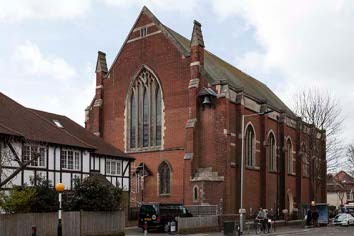 St Thomas was built as part of the expansion of western Hove. The foundation stone was laid in 1901 and the architects were Clayton and Black (ICBS). First, the raised basement, containing vestries and a hall, was completed. Part of the main church was opened in 1907 (CDG Nov 1909 p185) and construction ended in 1913 (VCH 7 p268), though a planned south chapel was never built and the west end is unfinished. The large church has a broad nave and chancel in one, roofed by transverse arches separated by tunnel vaults. The arches spring from the buttresses that articulate both the outside and inside walls. There are no aisles as such; instead, the tall arched recesses each side are linked by lower and narrower arches in the buttresses that form a processional way. The interior is faced with plaster and light stone; outside, the walls are brick with high windows with Decorated tracery. Goodhart-Rendel pointed out the influence of late G F Bodley and L A Stokes (AR p44 p78). It is well planned and massed, but is let down by some of the detail, whilst Bodley seldom used brick late in his career. The church became too big for its congregation and by 1991 was in poor repair. 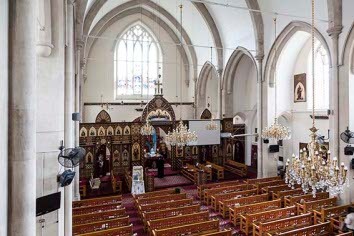 The congregation wanted to replace it by a more manageable church (VSA 1991 p65), but instead it was transferred to the Coptic community in 1993. This led to changes to suit a different liturgy, in particular a screen across the east end for the display of icons. Only the glass in the east window survives in situ. The church is now dedicated to St Mary and St Abraam. Altars etc: Painted tester of high altar by Sir W Tapper, 1929-30 (CDG June 1930 p151). He is said to have designed at least two other altars before 1918 (AR 44 ibid). There were also some unspecified fittings by W H R Blacking (BAL Biog file). 1. 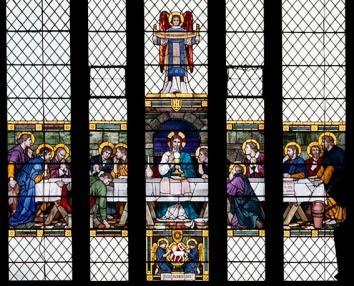 (South side, in the area used as a chapel) Two windows by Sir J N Comper, c1920 (now in St Augustine, Bexhill). 2. (East window) H R Mileham, 1948 (P Mileham p20), made by Cox and Barnard (www.stainedglassrecords.org).. This consists of a band of figures across the bottom of the window which is otherwise of clear glass. Pulpit: Sir J N Comper (Clarke papers). Stations of the Cross: (Now in St Mary, Brighton) These were by H R Mileham and were delivered over a period of time and in a variety of styles (CCL 1920 and P Mileham p14).